Check out some photos from past UWA Bike Breakfasts. Cycling is a great alternative mode of transport. It helps reduce parking and traffic problems, and is a healthy, energising and environmentally friendly way to get to campus. 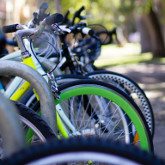 UWA encourages cycling as an alternate mode of transport to and from campus. It is a great option especially if you live within 10-15kms of campus - the time difference between cycling and driving is minimal and you avoid the cost and hassle of car parking. Open to UWA staff and students, our end of trip facilities, which incorporate showers, toilets, lockers, benches, change rooms and clothes drying spaces, are available at the Mathematics Building (223) and the Chemistry Lecture Theatres (210). Please note: these facilities will not be available until late-April 2019, due to maintenance being undertaken in the area. However, you can still register for access to the facilities now and we will process your application. We will contact you as soon as the facility is made available for use. Need help finding the easiest and safest cycling route to UWA? The Department of Transport produce a series of comprehensive bike maps covering the Perth metropolitan area. Download bike maps from www.transport.wa.gov.au/cycling or pick up copies from most bike shops. Google maps provides 'Get Directions' for cycling as well as public transport and walking. Bike parking rails are available extensively across campus. Take a look at the UWA bicycle users map [PDF, 222 KB] to see the closest rails to your destination. A secure bike cage is available under Lawrence Wilson Art Gallery. Another, incorporating electric bike recharging points, is situated next to the tennis courts. Contact UniPark for card access to this bike cage. Some buildings have bike cages available for their occupants. Please check with your relevant School or Faculty and arrange access via UniPark. There are two self-service bicycle repair stations on the Crawley campus. One is in Guild Village on the southern side of the Student Services building. The other is in the Wilsmore Lecture Theatre building, which is immediately east of Car Park 43. Invest in a good bike lock. D-locks are generally the most secure. For expensive bikes, use a D-lock as well as a cable lock, it's the best deterrence. Lock both wheels and the frame when using outdoor bike racks. Lock your bike even if it's inside a bike cage. Do not leave bikes out overnight or on weekends. If your bike is stolen report it to UWA Security and the Police. 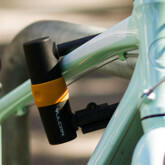 'D' bike locks are available for purchase from UniPark, for $25. Only cash/cheque accepted as payment, Monday to Thursday 8am to 4pm, or Friday 8am to 1pm. 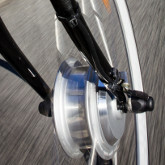 Electric bikes give you the option of pedalling when the path is easy and switching to power when you need it. Crawley campus has a bike shed designed especially for electric bikes with a capacity for 16 bikes. Each bike space has a battery recharging point that is powered by solar panels on the roof. The electric bike shed is located between the tennis courts and the Fitness & Recreation Centre. Contact UniPark for access to the electric bike shed. WA road rules apply on campus. For cyclists this means you must observe speed limits and wear a helmet. If you are involved in a car or bike crash, it is important you contact UWA Security.